Ductless heating and cooling systems offer efficient temperature control and thermostats that can be easily installed in any home or office, no matter the age. Whatever type of heating and cooling system you already have, a ductless system can be installed without the need to connect to or remove the old system. 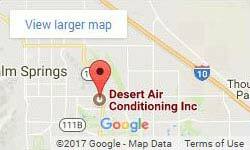 Desert Air Conditioning Inc offers energy-efficient ductless systems in Palm Springs and the surrounding cities. Why change to a ductless heating and cooling system? to operate. These systems individually control the temperature in each room where they are are installed, so you can switch specific rooms, or zones, on and off as you need them. This allows you to reduce the use of climate control in areas of your home or business while they are not in use, thereby further cutting back on energy use and utility costs. As stated above, a ductless system is easily installed in any home or business, no matter the current type of HVAC system you already have. They go into any room(s) where you want them. They only need access to electricity to be mounted anywhere in the room. They are especially great for new construction and add-ons as an easier, more efficient way to heat and cool the new space. These systems go where you want them and can be scaled up or down to fit your needs. Your air quality is only as good as your ducts. Dirt, debris, bacteria, mold, mildew, dust mites, pollen, animal dander, and more all collect in air ducts and are then spread throughout a home or office when the air circulates through them. Air filters only catch a certain amount of this grime and regular cleaning of the ducts can get expensive. Ductless systems make use of multi-stage filtration and do not rely on air ducts to heat or cool the air. The air circulated in your home will be cleaner and safer. Our air conditioning and heating contractors are happy to talk to you about what you need for your home and your budget. We can measure the spaces where you want to install a ductless system and help you find the right size system to fit the demands of the area. Our experienced installers quickly get your ductless system up and running just where you want it. We offer top brand names in ductless systems. You will get the best warranties and highest-efficiency available. Call today and ask us about financing and promotions we may be running on ductless systems in Palm Springs and the surrounding area.